15 The Bridge - St Lucia Accommodation. 15 The Bridge is an air-conditioned, 3 bedroom self-catering luxurious apartment located in a prestigious gated secure holiday resort on the main street of St Lucia, situated within walking distance of the beach, shops and restaurants. The resort is banked by the St Lucia estuary, and hippos can often be seen grazing in the gardens. The resort also has 2 swimming pools, BBQ/braai facilities, a tennis court and viewing deck of the estuary. The main bedroom includes a ceiling fan, queen bed, dressing table with hairdryer and lots of cupboard space. The spare room has 2 single beds and a large cupboard. The kids room has a double bunk bed with small sitting room overlooking the beautiful resort gardens. The modern kitchen is fully equipped with a washer, dryer, fridge, microwave and counter top stove. The living room has a large flat screen smart Tv, free Wifi and DSTv. The bathroom has an open shower and modern basin and toilet. The patio has a large table and chairs, perfect for picnics while viewing the beautiful resort gardens. The allocated parking is secure and directly in-front of the entrance to the unit. The apartment is perfect for families looking for an active scenic holiday, overseas visitors looking to explore Africa and the corporate traveler who needs to feel at home. 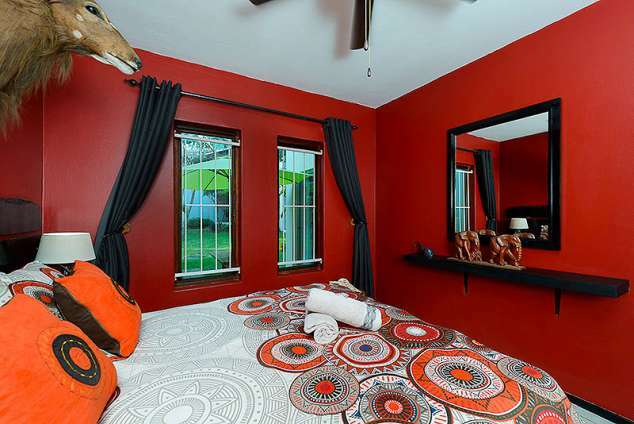 With an African theme, the decor gives you the feeling of the wild while also letting you relax. 2817 page views since 15 Sep, 2017.